The Canadian manufacturer Blackberry, which was once the undisputed king of the smartphone market globally, launched a queer looking phone with a square screen last week. Passport, the new device named so because of it being almost same in shape and size to a passport, was launched in the Indian market earlier today priced steeply at Rs 49,990. The timing of the new launch seems to be perfect for BlackBerry because Apple Inc. is still having a tough time dealing with the #bendgate scandal and the minor glitches with the iOS 8.0 software. The new device measures 128 x 90.1 x 9.3 mm and has a 4.5 inch square screen with 1440 x 1440 px resolution. The most striking feature of this device, apart from its 453 ppi pixel density, is its three row hardware keyboard. The keyboard which is missing in most touchscreen devices available at the moment, makes it a touch-and-type phone. The users can scroll across lists, use the swipe function or choose to type. Additional lines of keyboard flash up across the screen, depending upon the type of page being viewed. The adaptive keyboard allows for missing symbols and punctuation marks as the user types along and is said to reduce typos by almost 74%. Moreover, users can view 60 characters per line of text, while iPhones don’t come ever close. Passport comes with a 2.2 GHz Qualcomm Snapdragon 801 processor which makes it almost as fast as an average laptop these days, 3 GB RAM and 32 GB internal memory, which is further expandable using a microSD card. The 13MP rear camera focuses quickly and comes with optical image stabilization feature which means blur-free images even for shaky hands. The front camera is 2 MP. Besides that, the camera has a time-swipe setting, which allows the users to o take multiple images and move and back forward to select the best from a set. With a 3450 mAH i.e. approximately 30 hour battery life, this device could make the Apple users go green with envy. It runs on BlackBerry 10.3 OS onboard, which comes with features like the BlackBerry Assistant, and a brand new BlackBerry Hub with Instant Actions. Additionally, the users also get access to the Amazon App store for Android and roughly 240,000 apps. Passport further comes with BlackBerry Blend, a program which permits the phone to connect to the computer easily. That, in effect, means that the messages, missed calls, spreadsheets, presentations and other notifications can be seen on a larger screen. A feature that is likely to go very well with most executives and in the corporate circles. Will it help Revive BlackBerry Fortunes? Passport is the first major launch by the Canadian giant after Chief Executive Officer John Chen took over and he hopes it might help bolster its financial performance. “When you come out of restructuring, when you come out of financial problems, once you stabilize the company, customers and the market will only respond if you’re innovating again,” said the BlackBerry Chief Executive Officer John Chen in an interview before unveiling its latest product on Wednesday. BlackBerry Passport will be available for pre-order from today onwards (till 10th October) exclusively on Amazon India. 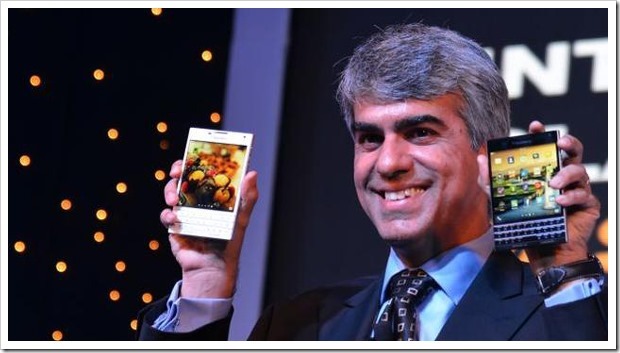 Consumers who pre-order the phone will get an Amazon India voucher worth Rs 5,000 and 5000 Jet privilege miles. The manufacturers, who are targeting the highly profitable high-flying executives and power professionals with this device, have come under a lot of flak for its unusual shape. The square screen in particular. The critics notwithstanding, the initial sales augur well for the future. After all, selling 200,000 sets within a week of its launch is no small achievement. Chen has gone on record to claim that all the handsets available on BlackBerry’s personal website and over Amazon were sold out within 10 hours. Though it is too early to predict, rave reviews from highly satisfied users might mean that the initial euphoria is expected to continue. That could well mean turning over a new leaf for BlackBerry. I have only one word to say “LOL”..Why would one go for Blackberry devices when there are likes of Android and ios devices in the range of 50k.